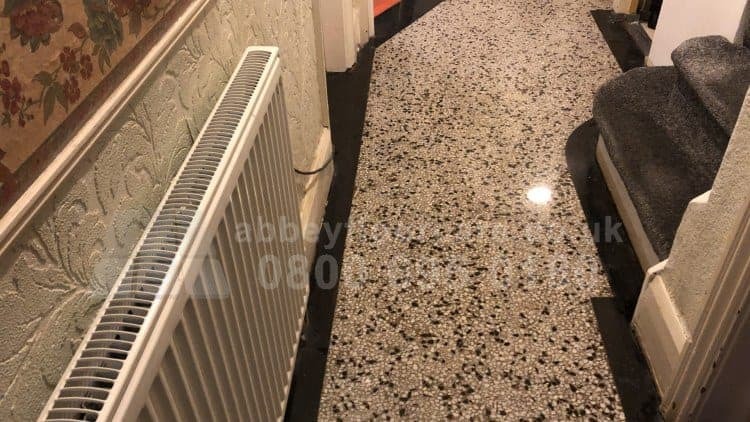 The Terrazzo polishing Smethwick B17 project concerned an original 1930's Terrazzo floor installed in the hallway of a home in Smethwick, West Midlands. The homeowner discovered the floor after lifting a carpet in the hallway as part of the ongoing restoration of the property. 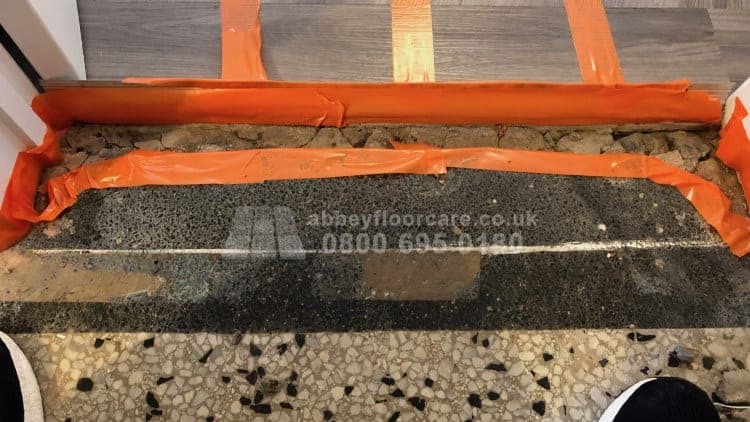 After discovering the original Terrazzo floor, they were keen to have the Terrazzo restored and polished to an elegant finish. There were four main issues with the condition of the floor. The surface of the Portland cement was powdery and porous from years of cleaning with strong alkaline cleaners. I started the Terrazzo polishing by protecting the walls, preventing the slurry splashing and leaving marks on the walls. First, I had to lift the transition bars covering the join between new flooring in the main rooms and the hallway floor. 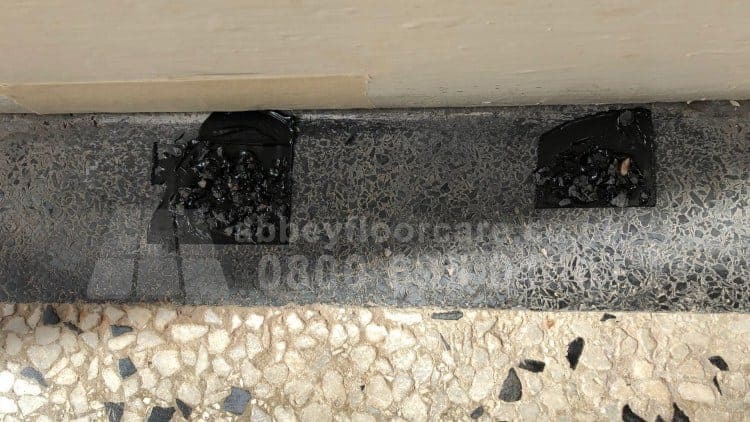 Luckily, thin flexible adhesive secured the transition bars to the floors. So they could be lifted without damaging the bars of the flooring. I used a hammer and chisel to break up the cement infill and removed the loose filling. 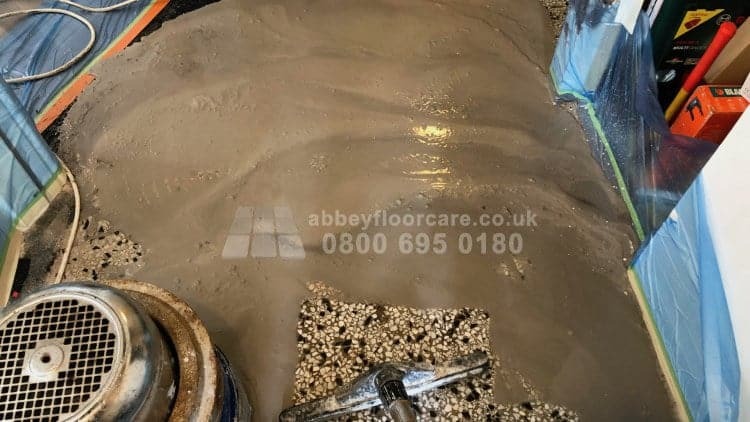 The subfloor in the repair was damaged and loose, so I poured a low viscosity resin filler to stabilise the subfloor and stop any future movement. Once the resin had cured, I used glass fibre to strengthen the repair and cover any remaining holes. After the glass fibre had cured, I filled the repair with a black repair filler. I used some of the original Terrazzo that had broken away to make small black chips. I mixed the black chips with black filler and used this as the surface of the repair. Once the repair had cured, I ground and honed the repairs smooth with the existing floor. I also used some of the black filler and black chips to fill the holes along the edge of the floor. Once the filler cured, I ground and polished the repairs to match the surrounding floor. While the Terrazzo repairs were curing, I started the Terrazzo grinding with metal diamond tooling. The grinding removed the old, dull, porous finish. 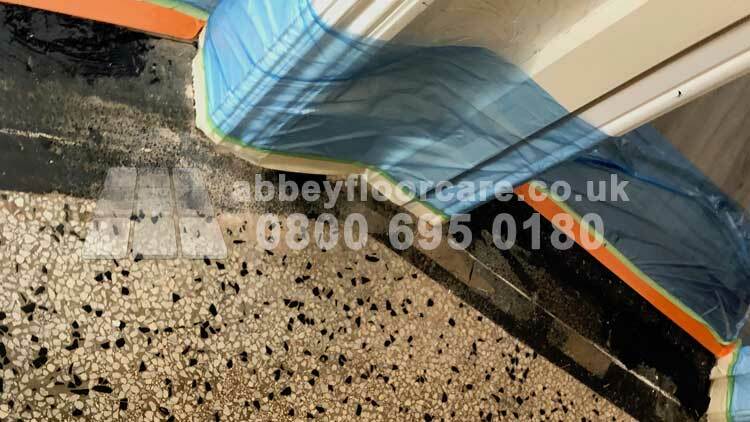 After grinding, I progressed to Terrazzo honing with diamond tooling to remove the scratch marks made by the grinding process. 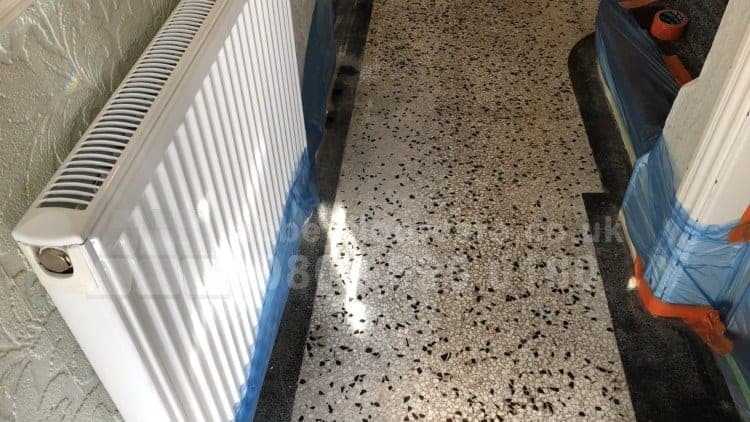 After the Terrazzo honing, I applied a densifier to strengthen the floor and improve the finished shine. I left the floor overnight for the densifier to fully cure. I started the Terrazzo polishing process with fine diamonds, giving a beautiful smooth finish ready for powder polishing. 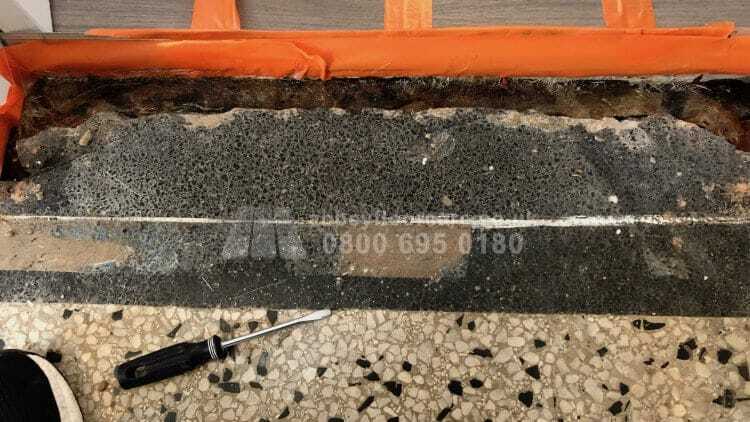 Unfortunately, in an area of the floor, tiny pieces of cement grit got caught in the diamond tooling, leaving deep scratches in a third of the finish. So, I had to hone and polish the area again, adding a few extra hours. 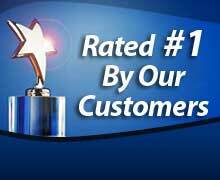 I finished he Terrazzo polishing with marble polishing powder, giving a deep lustrous shine. 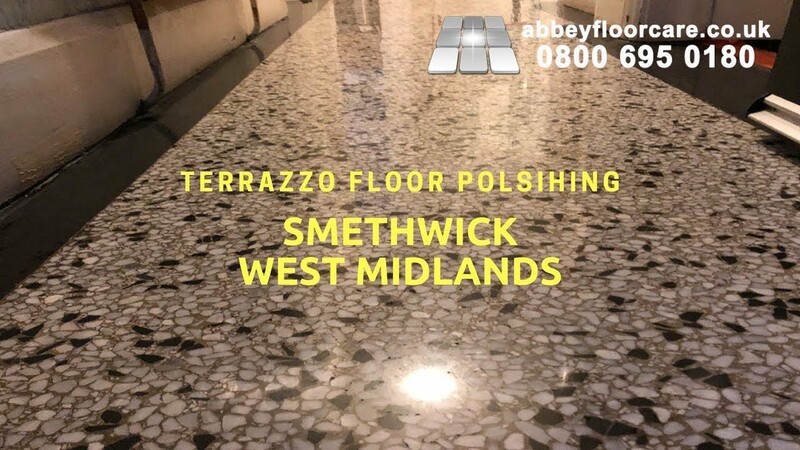 As well as Smethwick, we also offer Terrazzo polishing and other Terrazzo restoration services in the surrounding areas of West Bromwich, Birmingham, Selly Oak, Blackheath, Halesowen and areas in Te West Midlands. 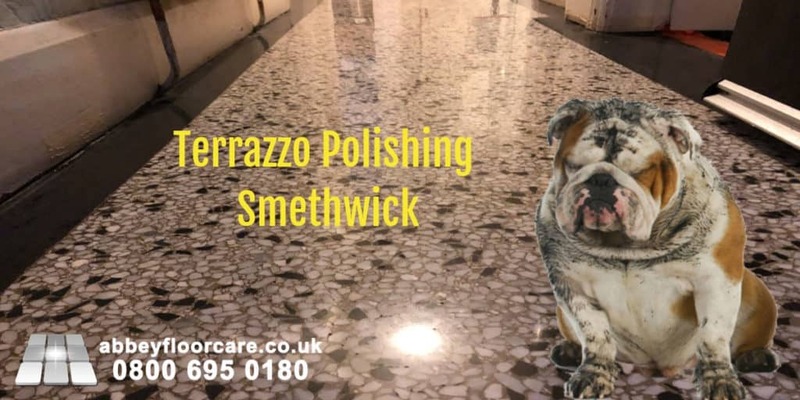 If you are searching for Terrazzo Polishing services in these areas, please give me a call on 0800 695 0180 or drop me a line. I look forward to helping you.